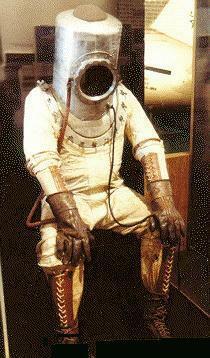 American pressure suit, operational 1934-35. B F Goodrich made a full pressure suit for pioneering aviator Wiley Post, who used it to make ten stratospheric flights in 1934-1935. The suit was of double ply rubberized parachute fabric, with pigskin gloves, rubber boots, and an aluminum helmet, pressurized to 0.5 bar. The pressure suit used a liquid oxygen source and had arm and leg joints that permitted easy operation of the flight controls and also enabled walking to and from the aircraft. Post wore his suit aboard his Lockheed Vega, the Winnie May, to set unofficial records up to 15 km altitude. In the process he discovered the jet stream. Post's pioneering accomplishments were the first major practical advance in pressurized flight. Ten flights were made in the suit beginning on 5 September 1934. In March 1935, Post flew in the stratosphere using the jet stream from Burbank, California to Cleveland, Ohio. At times, his ground speed exceeded 550 kph in a 290 kph aircraft. Post's death in an air crash due to an engine failure shortly after takeoff on 15 August 1935. Family: Space Suits. Country: USA. Agency: Goodrich. Bibliography: 487.